DP: What is your name, what grade are you in, and what school do you go to? KL: My name is Keegan Leverett and I'm in the 8th grade at Saint Stanslaus. DP: What is your current Personal Record (Best Time)? KL: My 5k PR is 17:57. DP: What is the next goal or time that you are trying to hit? KL: I'm trying to get down to 17:30 next. DP: What is your favorite workout your Coach has you do? KL: I like 5k time trials. DP: What is your least favorite workout? KL: I don't like 800 or 1200 repeats. DP: What are your plans after high school? KL: I want to go to college to get an education but I also want to play a sport in college. DP: What motivates you to run? KL: Knowing that God gave me this gift for a reason and I should never waste it. DP: What do you think about when you're running? KL: I like to think about my family and my personal life to take my mind off running. DP: Do you have any superstitions on race day or perhaps an odd pre-race routine? KL: I never eat before a race, and I like to take a nap before races if I can. DP: Two quick ones. . . Gatorade or Powerade? Jersey (Singlet), tucked or untucked? DP: What is your GPA and ACT score? KL: I have a 4.0 and a 21 on the ACT. DP: 21 on the ACT is awesome for an 8th grader! KL: Yes sir, I took it as part of the Duke University TIPS program last year. DP: Do you have a favorite meal for the night before a race? KL: I usually just eat anything with lots of carbs. DP: Do you take ice baths? If yes, what do you think about during an ice bath? KL: Yes, and they stink! I just like to think about how funny it will be when my teammates have to do this. DP: Name a lesson that running and training as a runner has taught you. KL: Even when you think you're done or you have nothing left, that is never true. You can always achieve your dreams if it is truly what you want in life. DP: Do you have a rival runner? Or who is your team's biggest rival? KL: My rival is my teammate, Landry Lemoine. Our team's biggest rival is either Corinth or Senatobia from northern Mississippi. DP: What do you do to recover after a race? KL: I always stretch and eat a big meal. DP: What is your favorite thing about your coach? KL: He talks as if he's not a coach but a humorous and comforting persona who will always make you laugh. DP: What is the strangest thing you've seen during a race? KL: The strangest thing would be when a dog literally chased my on my final sprint to the finish line. DP: Who is your biggest fan? 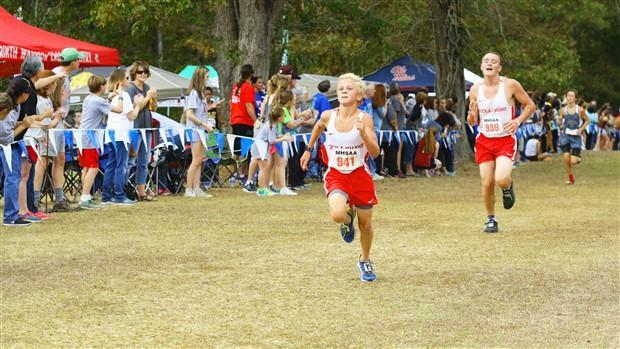 DP: What advice would you like to share with younger runners, maybe the JH kids on your team? KL: Live life doing what you love and want because it doesn't last long. DP: Thanks Keegan, you are wise beyond your years.